It’s an honor to serve as president of NAFFS as it marks its 100th year. Many have gone before me; many will follow. I’m grateful to be in such esteemed company. I’m also grateful to be a part of an association that has helped our industry for a century and is primed to continue to do so for many years to come. NAFFS will mark its centennial in many ways throughout the year, the biggest way being with its Centennial Celebration May 18th in New Jersey. Whether you’re reading this before or after that event, please visit www.naffs.org for details, photos, and etc. While it’s tempting to spend a lot of time touting our organization’s history, we decided in this publication to continue to be true to that history and, as we’ve done for the 40+ years it’s been published, use it primarily to summarize presentations from our most-recent convention. We’re on a trend of setting new attendance records every year because, as you’ll see in reading the publication, we’re addressing areas of keen interest to those in our sector. We do this throughout the year through our meetings, member communications and special projects. The Food Safety Modernization Act is a prime example. As you’ll see in the article that begins on Page 22, an FDA official spoke at the NAFFS Convention. It was the second year in a row FDA sent a speaker to our convention. 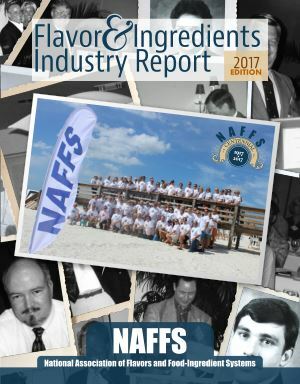 All NAFFS member companies received in 2016 a 60-page summary of FSMA, prepared exclusively for NAFFS members by a law firm that specializes in FDA matters. While 60 pages may seem like a lot, it’s much less than the thousands of pages of FSMA regulations. With NAFFS membership being on a company level, we were able to share that FSMA guide with everyone else at our firms. Through its relationship with the Association of Food Industries, NAFFS was also able to offer FSMA Preventive Control Qualified Individual training to its members and will continue to do so in 2017. Now that the course on Foreign Supplier Verification Programs is ready, NAFFS will offer that as well; NAFFS Executive Director Bob Bauer served on a task force that helped design that course. We work with other associations as well. Jerry Bowman, executive director of the Flavor & Extract Manufacturers Association, was another speaker at our convention, continuing a long history of FEMA participating in NAFFS meetings. Our organizations continue to make our programs available to one another and work together on industry issues. Jerry addressed the impact of social and digital media on our industry and offered ideas on how to fight back and/or get out in front of such issues. A secret to the success of any organization that lasts 100 years is the ability to adapt and keep moving forward. NAFFS made a fundamental change to its meeting philosophy about a dozen years ago; committees designing our meetings aggressively sought to engage as many of our senses as possible in many of our presentations. As a result, almost every NAFFS meeting now includes at least one presentation that includes a chef demo and/or some other type of tasting. Seeing, smelling and tasting what the speaker is covering is a great way to drive the point home and has helped raise the bar in terms of the experience in attending a NAFFS meeting. Look for that trend to continue. Global Trends on Texture & Taste, Anh Nguy, Project Leader, Culinology, Ingredion Inc.